Q: Was the first family attacked by a terrorist during the Easter holiday weekend? A: No. That’s a misrepresentation of an act of vandalism at Trump International Golf Club. Several of Donald Trump’s properties have been defaced since he became president. At two of his golf courses, vandals carved an environmental message into a green and spray painted the word “resist” onto a fairway. Vandals also splattered black paint over an Adopt-A-Highway sign bearing his name in New York. Most recently, red paint was splattered on the sign for Trump’s golf course in West Palm Beach, Florida. But there is no evidence that the incident was an act of terrorism. The FBI handles terrorism investigations, and the spokesman for its Miami office, James Marshall, referred us to the Secret Service when we asked about the paint incident. Secret Service spokesman Shawn Holtzclaw told us that his office is investigating the incident along with the Palm Beach County Sheriff’s Office. Neither agency would say whether or not they suspected terrorism, but the FBI’s lack of involvement suggests that it’s not being considered a terrorist threat. Also, the incident didn’t happen at Mar-a-Lago, Trump’s private club in Palm Beach, Florida. It occurred at the Trump International Golf Club, which is a 15-minute drive away, according to Google Maps. Still, several other websites copied the headline and posted the same story. Facebook users flagged those stories as potentially false. The headline is false, but the story itself is mostly opinion with a large portion about the actual vandalism incident that was copied from the ABC News affiliate in Miami. The story with the false headline originated on a website called Daily Vine, which was created on Jan. 20, according to domain ownership records. That website appears to be related to Freedom Daily, a prolific creator of ultra right-wing stories that recently shut down. 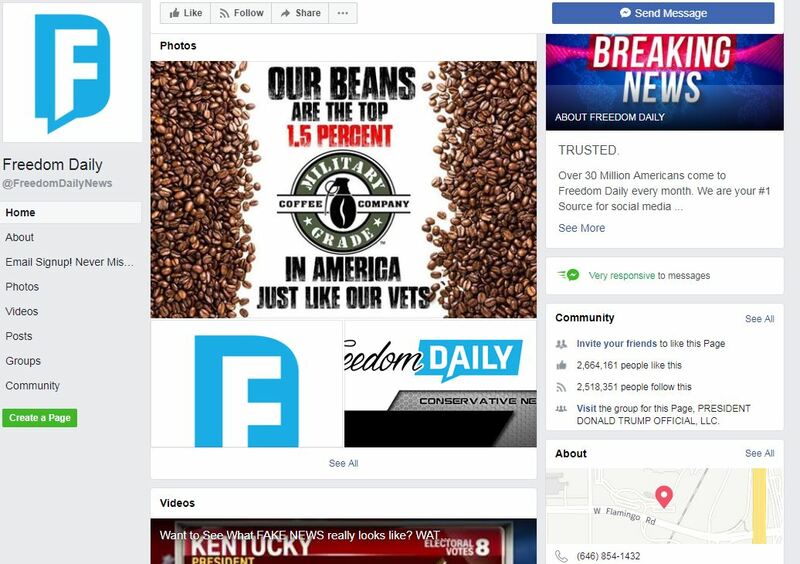 Now the Freedom Daily site displays a message on its homepage that says, “This website has gone out of business.” Its Facebook page, which had 2.5 million followers, is also no longer active. But the authors listed on Freedom Daily are the same ones listed on Daily Vine, like Liberty Belle, whose name appears on this exaggerated story. The photo and bio are the same on both sites. “BREAKING! Terrorist Attacked Trumps At Mar A Lago – Police On Scene.” Daily-Vine.com. 1 Apr 2018. Osborne, Mark and Rogin, Ali. “Trump International Golf Club sign splattered with red paint by vandals.” ABC 10. 1 Apr 2018. Kaplan, Alex. “Some fake news websites have lost their Facebook verification.” Media Matters. 18 Jan 2018. “Facebook is now determining what information you should see in your newsfeed.” FreedomDaily.com. Accessed 3 Apr 2018. Engel Bromwich, Jonah and Haag, Matthew. “Facebook Is Changing. What Does That Mean for Your News Feed?” The New York Times. 12 Jan 2018. "Terrorist Attacked Trumps At Mar A Lago."